There are different approaches in big data world to make Hadoop more suitable for ad-hoc, interactive queries and iterative data processing. As it is very well known, Hadoop MapReduce framework is primarily designed for batch processing and that makes it less suitable for ad-hoc data exploration, machine learning processes and the like. Big data vendors are trying to address this challenge by replacing MaReduce with alternatives. In case of SQL on Hadoop, there are various initiatives; Cloudera Impala, Pivotal HAWQ or Hortonworks Stinger initiative that aims to improve Hive performance significantly. 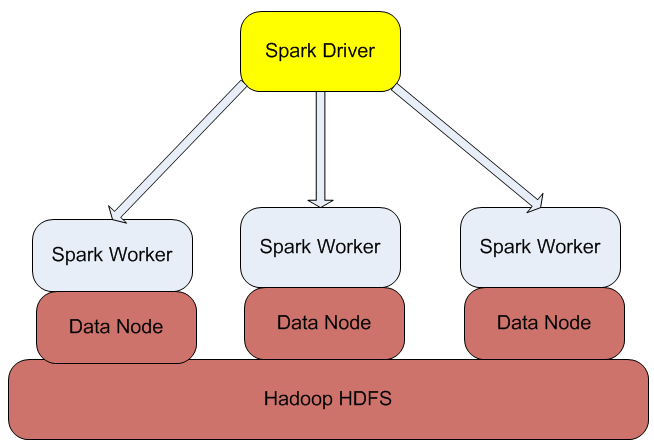 Apache Spark is another increasingly popular alternative to replace MapReduce with a more performant execution engine but still use Hadoop HDFS as storage engine for large data sets. From architecture perspective Apache Spark is based on two key concepts; Resilient Distributed Datasets (RDD) and directed acyclic graph (DAG) execution engine. With regards to datasets, Spark supports two types of RDDs: parallelized collections that are based on existing Scala collections and Hadoop datasets that are created from the files stored on HDFS. RDDs support two kinds of operations: transformations and actions. Transformations create new datasets from the input (e.g. map or filter operations are transformations), whereas actions return a value after executing calculations on the dataset (e.g. reduce or count operations are actions). The DAG engine helps to eliminate the MapReduce multi-stage execution model and offers significant performance improvements. Spark is written in Scala so before you install Spark, you need to install Scala. Scala binaries can be downloaded from http://www.scala-lang.org. Welcome to Scala version 2.10.4 (Java HotSpot(TM) 64-Bit Server VM, Java 1.6.0_32). Then you can download Spark binaries from http://spark.apache.org/downloads.html. There are a couple of pre-compiled versions depending on your Hadoop distribution; we are going to use Spark binaries built for Cloudera CDH4 distribution. In our example we are going to process Apache weblogs that support the common logfile format having the following fields: hostname, timestamp, request, HTTP status code and number of bytes. The test file that we are using in this example is based on the public NASA weblog from 1995 August, see http://ita.ee.lbl.gov/html/contrib/NASA-HTTP.html. The file was cleaned and modified to support tab separated format. The first command creates an RDD from the NASA Apache access log stored on HDFS (hdfs://localhost/user/cloudera/weblog/NASA_access_log_Aug95). The second command (an action executed on the accessLog RDD) will count the number of lines in the file. Note that the execution time is around 2 seconds. You can also execute more complex logic and define your own functions, thanks to Scala language capabilities. Let us assume that we need to calculate the total number of bytes generated by the given NASA web server in August, 1995. The number of bytes is the last (5th) field in the lines in the weblog file and unfortunately, there are cases when the field is ‘-‘, not an integer value as it would be expected. The standard toInt Scala String function throws an exception if you want to convert a non-numeric value into Integer. Thus we need to be able to identify whether a given string is a number or not and if not, we need to return 0. This requires a custom function (convertToInt) that will extend the standard String Scala class and will be made available for the String data type. Then we can use this custom function and the Spark standard RDD operations to calculate the total number of bytes generated by the NASA webserver. As you can see, the result is 26,8GB and the calculation was executed in 5.5 seconds. In addition to spark-shell that can be used to execute operations interactively, you can also write and build your code using Scala, Java or Python programming languages. Let us take an example how you can implement your weblog application in Scala. You can copy sbt build tool from your Spark home directory (cp -af $SPARK_HOME/sbt/* ./sbt). libraryDependencies += "org.apache.spark" %% "spark-core" % "0.9.0-incubating"
resolvers += "Akka Repository" at "http://repo.akka.io/releases/"
libraryDependencies += "org.apache.hadoop" % "hadoop-client" % "2.0.0-cdh4.4.0"
14/04/01 14:49:01 INFO ConnectionManager: Selector thread was interrupted! Apache Spark has started gaining significant momentum and considered to be a promising alternative to support ad-hoc queries and iterative processing logic by replacing MapReduce. It offers interactive code execution using Python and Scala REPL but you can also write and compile your application in Scala and Java. There are various tools running on top of Spark such as Shark (SQL on Hadoop), MLib (machine learning), Spark Streaming and GraphX.It will be interesting to see how it evolves.